3DF Zephyr pro requires a fair amount of temporary storage. By default, a directory will be created inside your %tmp% path, however, it is possible to manually change this setting – this is especially useful if you are using separate hard drives. the “Options” window will appear. Click on the “Application” Tab (2) and then click on the “…” button (3) to locate your preferred path. 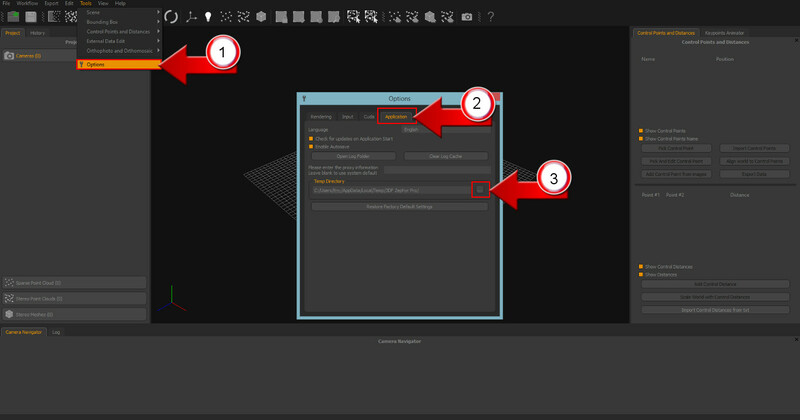 Confirm the changes and restart 3DF Zephyr Pro to apply the changes.